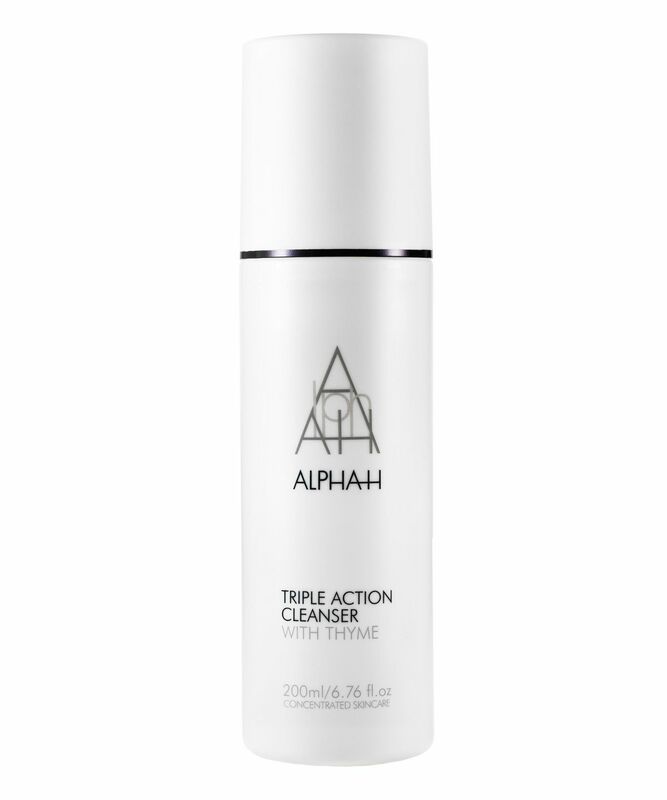 Why bother with eye make-up remover, face wash and toner when Alpha-H Triple Action Cleanser will does the job of all three - and then some! This cleanser is packed with anti-oxidants and botanicals to blitz bacteria and excess oil without stripping skin of essential moisture, making it ideal for tackling acne. Innovative Aussie brand Alpha-H specialises in solving big skin problems without falling back on obvious, mostly chemical solutions used by other brands. Finding a cleanser that removes every last trace of make-up (even waterproof mascara) while actually improving your skin is a tough task, but that's exactly what Alpha-H Triple Action Cleanser does. This light gel contains antibacterial thyme extract to minimise excess oil and acne breakouts, plus soothing, hydrating aloe vera and calming cucumber. It's free from foaming agents, detergents and sulphates and will restore skin's natural pH balance. Apply Triple Action Cleanser liberally by massaging gently over dry face and neck (use sparingly around the eye area). Rinse off thoroughly with warm water. Apply a small amount to a damp cotton pad to remove colour-fast eye and lip make-up. Aqua, PEG-7 Glyceryl Cocoate, Aloe Barbadensis Leaf Juice, Glycerin, Polysorbate 20, Phenoxyethanol, Caprylyl Glycol, Cucumis Sativus Extract, Acrylates/C10-30 Alkyl Acrylate Crosspolymer, Potassium Hydroxide, Disodium EDTA, Thymus Vulgaris Leaf Extract, Parfum. This is my no. 1 favourite cleanser, works wonders on my acne prone and sensitive skin. This is a very strange product. It has a very light, transparent, gelly but almost inconsistent texture so that you put it on your face and you feel as if you were massaging clear water. Then, you see the results. At first, I used it as a second cleanser, and it was an excellent one, it leaves your face squeaky clean without stripping it. But the real surprise came when I used it as a make-up remover. Oh, my! This is better than any make-up remover ever (oily, not-oily, micellar water...anything). It removes any trace of makeup in a flash, it's so good I cannot even explain. Amazing product, I'm on my second bottle and definitely will repurchase again and again. (38, sensitive combination skin). I'm using this for almost a year (I'm on my 3rd bottle now), I have oily skin that breaks out from almost every new product I try, but this is just a great cleanser. It cleanses the skin so well, but also in a very gentle way. My skin looks and feel great after using this, and I highly recommend this. Simply the best cleanser I've found! I have dry somewhat mature skin that is a bit sensitive too with an occasional hormonal spot on and off for reference. I have been looking everywhere for a non foaming cleanser that can still be used with water and does not contain a lot of oils, (which I can't use around my eyes due to eyelash extensions). Most cleansers that are oil free are alarmingly stripping for dry skin, (or any skin really). This beautiful cleanser does not strip the skin's barrier at all but leaves the skin supple an non irritated after you rinse it off, every time! It is a simple cleanser with not too many ingredients which makes it safer than most products for sensitive skin. It does smell nice too, even though it is not fragranced. If I have a lot of make up this is my second cleanse, and it is all I use in the morning. It handles light amounts of make up well, but the recommendation on my bottle, (I buy this in the larger pump bottles with 500 ml please start stocking those here at Cult! :)), is to use this as a second cleanse for make up removal. It is simply the best cleanser out there IMO. And it does not get the praise it so deserves! I am on my fourth big bottle of this which means I have been loyal to this guy for more than three years. That alone says a lot! I love this cleanser so much! It's a gel to oil formulation that feels amazing on the skin, and it's great for combo/easily congested skin, if you fear richer formulations. It does remove makeup but I never really use it for that. At the beginning I hated the smell - not too strong but just didn't like it, I barely feel it now. I will definitely repurchase. Having read all the information and the reviews available I was very excited about this. I am so fed up with spots. I liked it for maybe the first week, it has a pleasant smell and texture and feels as if it is doing something to your skin but in the second week my skin became sensitive and red and I broke out again into some very nasty spots. My skin is very temperamental and can be quite spotty anyway but as soon as I gave in and went back to my old cleanser my face cleared up straight away and felt soothed again. If your skin is at all sensitive this is not for you, it is not as soothing as it claims. My first product from Alpha H and I'm glad that I bought it. It is very gentle for sensitive skin, non-foamy and unscented. But it is an effective cleanser. 100% will repurchase. This smells great but for my extremely oily skin, it just doesn't feel like it cleans deeply enough. I will finish the bottle but won't be repurchasing. I have tried so many cleanser by so many brands and decided the cleanest and more natural ingredients are the best. I have used Sunday Riley's Ceramic Slip and loved it then bought the Alpha-H Balancing cleanser and Triple Action cleanser and I really really love them, especially together. I would use them alternatively and depending on my skin condition. I ran out of them and decided to try new ones and bought Elemis Resurfacing cleanser and Sarah Chapman's Rapid Radiance cleanser and both had very good reviews but were nowhere as good as Alpha-H cleansers. I also tried ceramic slip again and Mama Mio cleanser but wasn't as impressed anymore (they are good though). I think Alpha-H cleansers are way better and gentler and hydrating for my dry and usually irritated skin. It smells great, which is quite important to me especially in the morning. It removes makeup, but it is not as gentle as it could/should be. I am using this gel for 8 days and love it already. I used to wash my face with liquid soap with 5% benzoyl peroxide and it was drying out. I am no longer in my 20's so this is not a good thing. But this cleanser is so lovely, it cleans really well without stripping my face. I just love it.